RIO DE JANEIRO, BRAZIL – Dejan Petković bowed out of football (soccer) on Sunday amidst huge fanfare. The 38-year-old former Real Madrid midfielder has spent over a decade in Brazil but found a second home at Flamengo. Victory was not secured in the legend’s last game, but the party to bid him goodbye was emotional and boisterous. Petković retired from football after his final game for Flamengo on Sunday, photo by Alexandre Vidal/Fla Imagem. It turned out to be a disappointing weekend for Carioca clubs in the national Campeonato Brasileiro tournament, as Botafogo drew and Vasco were thrashed by cup final opponents Coritiba. Only 2010 champions Fluminense managed to win. With Fred called up to national duty, Rafael Moura filled the void for Fluminense with both goals in their 2-1 win against Cruzeiro in the Engenhao. Again, Flu had Deco to thank for their creative output. Cruzeiro started stronger and the Tricolor did well to weather an early storm before emerging from the blocks with Deco at the forefront. He dribbled, he passed, he threatened and in injury time set up Flu’s opener for Moura. Cruzeiro again started the second half strongly, sending an avalanche of attacks towards the Fluminense goal. Gum and Leandro Euzebio were excellent at the heart of defense, but as Flu failed to attack Cruzeiro equalised through Anseimo. The goal woke up Fluminense and it took them just five minutes to retake the lead. Valencia won the ball in midfield and found Rafael Moura free in the area, who poked the ball past keeper Rafael. 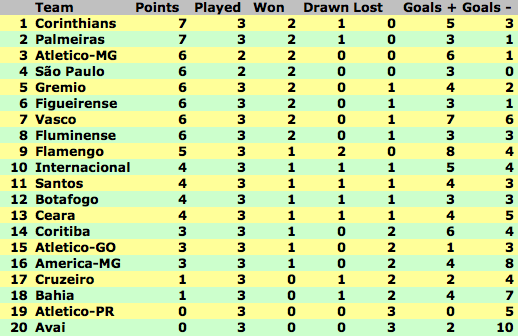 An excellent contest in Fortaleza ended even as Ceará and Botafogo drew 2-2. The game had an attacking rhythm as both teams went all out to win. Maicosuel had an excellent game for Botafogo and had a hand in Ekeson’s opening goal on 28 minutes, his first for the club. Defensive errors cost the Rio side as they allowed Ceará back into the match cheaply. Goalkeeper Renan failed to hold a weak shot and Osvaldo gobbled up the rebound to equalize. The second half followed the same open pattern and Elkeson missed a great chance to give Botafogo the lead again. Everton was beginning to control the game for the visitors from midfield but Ceará went ahead just after the hour mark when Michel rifled home from thirty meters. Antonio Carlos rescued a point for Fogão from close range but both coaches will be disappointed defensive frailties let three points slip from their grasp. Rafael Moura was Flu's two goal hero on Saturday, photo by Rafael Moraes/photocamera. On Sunday, all eyes were on Petković as Flamengo drew 1-1 with Corinthians. The star, “Pet,” was made captain and upon taking the field was greeted by a banner spelling out his name. His party was almost spoiled by Corinthians, who took the lead through Willian. An excellent free-kick from Renato leveled the scores but the match became a subplot to the main focus. As Petković bid goodbye at half-time to chants of “Stay!” from the Flamenguistas, he addressed the crowd. “To enter the field and see the colors of your country, with your name, was very emotional. I was touched. My Portuguese is not so good to describe in words what these fans mean to me. After 2009 [when Flamengo won the national title], I never thought I would see a better moment, but today was beautiful,” he declared. Finally, Vasco suffered their first defeat of the league season, losing 5-1 to Coritiba. Both put out weakened sides with an eye on Wednesday night’s cup final second leg, in which Vasco hold a 1-0 advantage. Despite the dire display from his team, coach Ricardo Gomes has guaranteed the result will have no bearing on his players come kick-off on Wednesday. Campeonato Brasileiro, Série A - Round 3.